Southwest Airlines will offer passengers the opportunity to use the iMessage and WhatsApp mobile software application programs for messaging aboard select airplanes during flights starting in October. 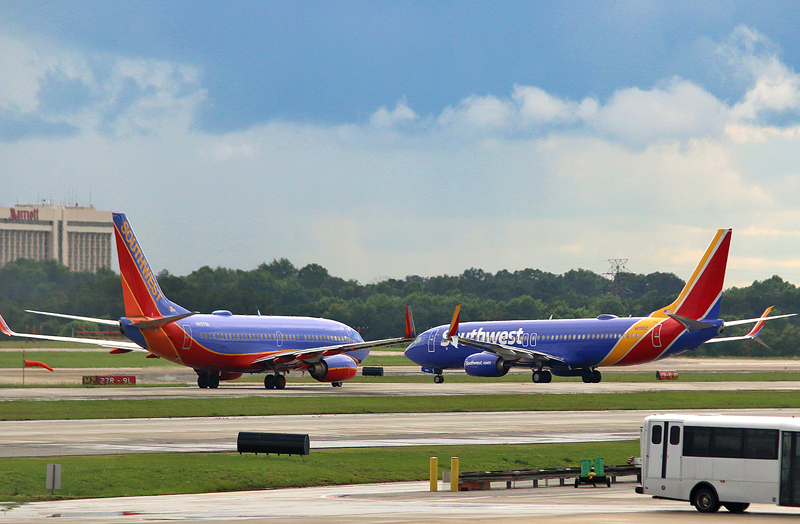 Southwest Airlines will require all passengers traveling with emotional support animals and psychiatric service animals to provide documentation of proof of health or vaccinations a minimum of 48 hours in advance of the departure of a flight effective as of Monday, September 17, 2018 — and emotional support animals are limited to only one per passenger; to only dogs and cats; and must remain in a carrier or be on a leash at all times. You can earn up to 12,000 bonus miles by shopping for the holidays 2017 from the frequent flier loyalty programs of three different airlines: American Airlines AAdvantage; Southwest Airlines Rapid Rewards; and United Airlines MileagePlus. FlyerTalk member pond fisher and his wife were passengers aboard a Boeing 737-300 airplane which operated as Southwest Airlines flight 362 from Philadelphia to Nashville yesterday morning, Tuesday, October 10, 2017 when a loud explosion suddenly occurred outside of the cabin. I have been asked to report on the incident which involved a woman who was forcibly removed from an airplane operated by Southwest Airlines — and we may never know exactly what actually happened depending on the account with which is believed. You can purchase airfares as low as $27.00 one way on flights operated by Southwest Airlines through tomorrow, Wednesday, September 27, 2017 at 11:59 in the evening of the respective time zone of the originating city — or you could use as few as 822 Rapid Rewards points to purchase a flight — through this sale, which lasts for only two days.